I found myself in a surprising state of melancholy bordering on a binge of weepy off and on today. I am blaming it on cramps, nostalgia and Thirtysomething, in that order. I was overcome with sadness as I sorted through old family photos this afternoon looking for pictures for another post. I picked my way through piles of pictures in no particular order, with few labels and no stories growing more upset with each new pile. I felt this overwhelming pressure to do something with them, tell their story (as much as I can) before it's too late. I don't know what exactly to do, but since many of them are from my parents and grandparents, I am the last link. If I don't attempt to document something, who will? Who will even care is the other question, but I hope Annelise will someday. Thirtysomething takes some of the emotional blame as well because Disk 1 of Season 1 came from Netflix and I watched it last night. 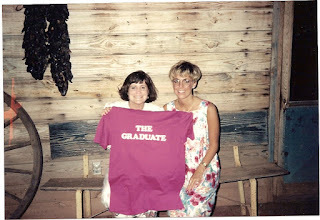 I was immediately thrust back to 1987 and all it's fashion faux paus. I was a faithful viewer of the show in college (being firmly convinced my life would be just like that when I was thirtysomething). I'm not sure why watching it again makes me sad, but it does. Certainly not because I am venturing into fortysomething, I'm sure. So I decided to try and shove the melancholy aside for a while by doing something fun. 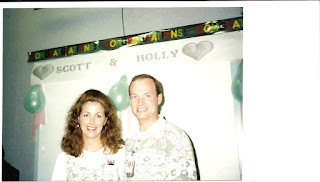 Let's make fun of Holly's hair, shall we? The wings that could withstand all gusts of wind thanks to gallons of Aqua Net hairspray. 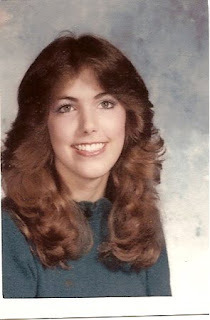 Not only were hot rollers and curling irons needed in the wee hours of the morning to achieve this look, I carried a butane curling iron in my purse so I could touch up between classes, definitely after PE. I don't know what to call this phase other than poofy. Hot rollers and hairspray were still my best friends. Tweezing (much less waxing) was not. My hair grew throughout my freshman year. By the time I was a sophomore I found a new best friend, the spiral perm. Because the regular perms just didn't make my hair wide enough. It was pretty bad. I looked like a shrub with tall bangs. In case you can't tell, they are touching the top of my car. 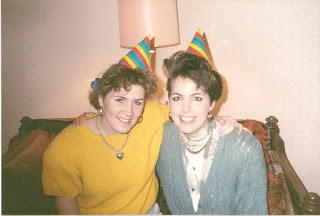 Somewhere between 1988 and 1989, in a bold move, I went short, super short. Except for my bangs, which somehow remained tall. 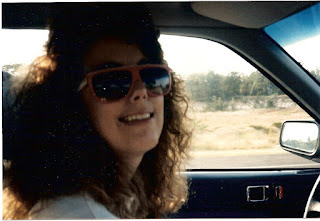 Then I let that grow again during 1989, so I could perm it again. Of course. Oh, and almost shave the right side of it and grow out the left to hang over my eye. Because I was just cool like that in my big floral print romper. And even cooler with ripped jeans and shoulder pads. did I do it? 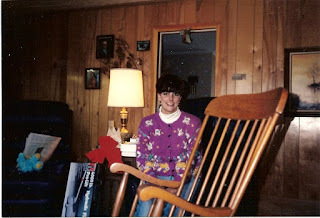 I know you are jealous of my turtleneck and chunky purple floral sweater, aren't ya? So the dark brown (black?) wasn't really working for me, so I went blond in 1991. Oh, yeah, I'm wearing another flower romper/jumper thing. It had legs, cuffs, empire waist and a zipper up the front. My love for it was clearly misplaced. Circa 1995. What can I say? I thought perms were my friend. Until I discovered a new obsession: The Rachel. Or at least my version of it. Well, you certainly found a good way out of the melancholic mood! I giggled my way through this post. Oh yes, the floral romper. I forgot about those! I feel the same sort of melancholy from watching Thirtysomething, but I can't stop watching it. I'm on disc 4 and loving it so much. 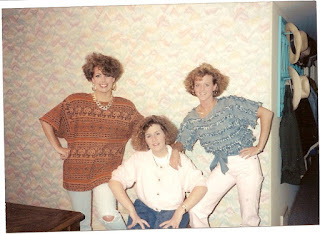 The hair time capsule is rather amusing and fun, you just gotta love the 80s! 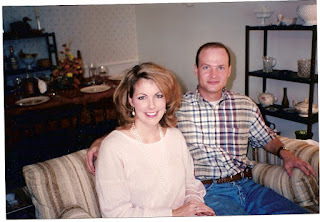 I'm proud to say I haven't had a perm since December 1989 when I got the perm to end all perms! I'm on disc 3 of thirtysomething now. It makes me melancholy too but I can't stop watching! the bangs, they are... impressive! the floral...ah the floral. I love that you and your friend AND the picture behind you are all in floral! I think live in SE TX has its advantages for big 80s hair. It helps the poofiness, don't ya think? Do they still make aqua net? thanks for the laugh so early in the am. Speaking of shoulder pads, I actually bought a pair of foam shoulder pads(they came in a can) that I could add under t-shirts and other shirts that didn't have them. Why? Oh Why??? I also can't believe I (we) thought big, bold floral patterns were flattering in any way. I looked like a bad couch. Say what you want....you've always had great hair, even permed. You haven't changed either. 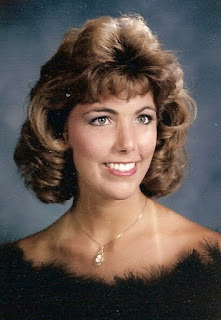 I had the same can of shoulder pads by the way. Maybe I should share some of hairdo's....that'll make you chuckle. butane curling iron... is that really safe in your purse?? Funny but interesting post! Great to see the old pictures of you! I should post some of mine, being that we're the same age and era! 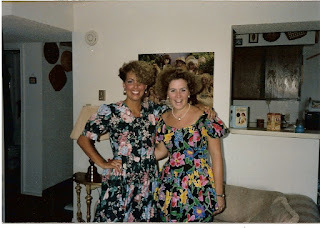 Ah, the florals and shoulder pads and hairspray. I too, went super short in the 90s and if I could lose 50 lbs, I'd do it again in a heartbeat. I loved it.